A cost-effective long-term storage that enables a cloud-based solution to trend years’ worth of time series data pivoted on devices/tags. A device-based (also known industry-wide as “tag-based”) user experience backed by a time series model to contextualize raw time series data with device metadata and domain hierarchies. Additionally, Time Series Insights will be integrating with advanced machine learning and analytics tools like Spark and Jupyter notebooks to help customers tackle time series data challenges in new ways. Data scientists and process engineers in industries like oil & gas, power & utility, manufacturing, and building management rely on time series data solutions for critical tasks like storage, data analysis, and KPI tracking and they’ll be able to do this using Time Series Insights. 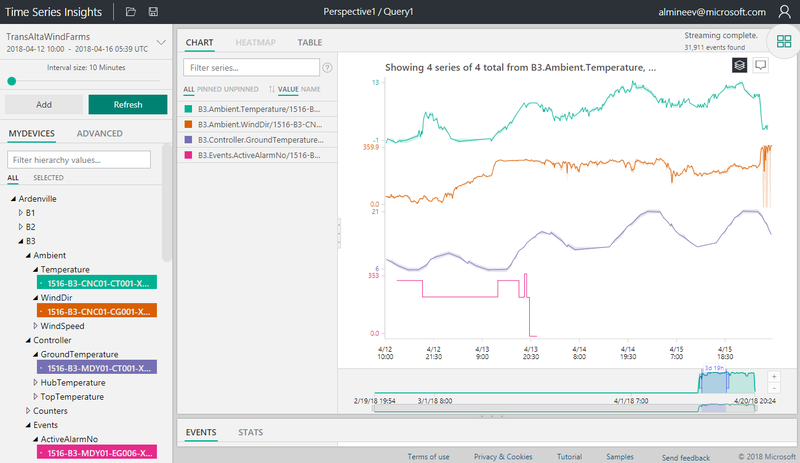 Time Series Insights’ current user interface is great for data scientists and analysts. However, process engineers and asset operators may not always find this experience natural to use. To address this, we are adding a device-based user experience to the Time Series Insights explorer. This new interface and the underlying time series model that backs the experience will enable OT workers to intuitively find devices related to the assets they care about. By enabling hierarchy and device-based semantics that contextualize the raw time series data, we enable richer and deeper analytics. This means that finding and comparing observation targets (i.e., devices/tags) to trend and explore in the Time Series Insights user experience or with our REST APIs will be seamless. The below diagram is an example of the rich tag-based experience that we are developing in the Time Series Insights explorer. 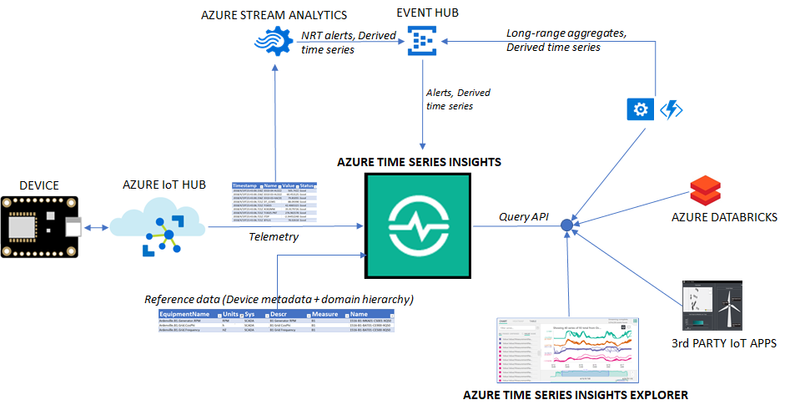 To help organizations effortlessly scale their time series solutions, Time Series Insights will offer seamless integration with massively-scalable, cost-effective storage, archival and queryability in Azure Storage. This additional layer of storage creates a powerful duality for customers to engage their data while maximizing cost savings. Our warm layer, what Time Series Insights customers know and use today, continues to support interactive analytics. With the cold layer, these same customers will now have a single-source of truth for their time series data in the cloud, at a price that works. We expect most customers to store 30–120 days of data in the warm layer, and 1–20 years in the cold layer, thereby blending the best of both worlds. Cold storage, coupled with device/tag-centric querying across all data, means that customers maximize the cost-benefits of the cloud while still realizing performant querying and trending of historical time series data. Time Series Insights will store data in Apache Parquet files based on device/tag and timestamp properties, thus optimizing integration with powerful tools like Azure Databricks. Integration with machine learning tools like Azure Machine Learning Studio and Jupyter Notebooks is simplified, so organizations can build models to predict future device states and avoid wasteful maintenance. Time Series Insights makes it easy to collaborate and share insights in seconds through integration with Power BI, Microsoft Excel, and other business intelligence reporting software. We’re collaborating closely with customers like TransAlta, to define and build this new infrastructure and solutions using Time Series Insights. Below are quotes from TransAlta’s CTO and Enterprise Architect attesting to the business advantages they see with adopting Azure IoT and Time Series Insights solutions. Time Series Insights provides a global view of an organization's data – enabling customers to collect and generate insights from highly distributed IoT data. Time Series Insights’ REST APIs can query across devices/tags, so customers can build domain-specific solutions on top of Time Series Insights to view data streaming from multiple sites in seconds and query data as fast as they can today with a server stored down the hallway. A great example of a customer building on top of Time Series Insights’ APIs is the industrial automation leader, ABB. Recently, ABB has adopted Time Series Insights as a focal point for their mining, ES, and robotics platforms that will use Time Series Insights’ long-term storage to empower their customers with rich monitoring and analytics solutions. Below is a quote from ABB Ability’s Group Vice President of Product on their use of Time Series Insights. With the capabilities we are announcing today, Time Series Insights is evolving from a short-term asset monitoring and diagnostics service to a modern cloud IoT platform for customers and partners to build highly-capable and scalable IoT solutions. We will be at Hannover Messe this week. Microsoft will exhibit in the Digital Factory at HMI (booth #C40), focusing on the benefits of intelligent manufacturing. We’ll feature the world’s leading innovators through solution showcases and allow you to engage with our newest technologies enabling our customers to build a IoT solutions. Don’t hesitate to stop by and learn more.